In my area of Southwestern Ontario, nearby lake fishing consists of the Great Lakes (Huron, Erie and their “little” brother St. Clair) or smaller reservoirs. Weather permitting and with the right boat, the Great Lakes present some of the finest fishing in the world and we are truly fortunate to have them in close proximity. Those reservoirs present a different challenge altogether, and yes, I do like a challenge. The land in this area is generally flat, highly productive farmland. Farming is big business, and ever increasing demands for higher crop yields have meant an increasing need for added fertilizers and nutrients for the soil to maintain this (and in all fairness, to keep many of these farms from bankruptcy and to keep you and I fed – I spent the first 20 years of my life on our family farm and know something of some of the pressures of the job). Ever growing cities and towns, founded on rivers dump ever increasing amounts of treated sewage and untreated storm runoff into them. These and other sources of nutrients fuel algae blooms that are occurring earlier and with greater intensity every year. 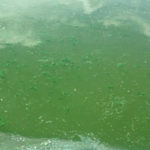 Recent headlines highlighting the algae blooms on Erie and St. Clair that threaten drinking water for hundreds of thousand of people attest to this issue. So how do we fish these smaller reservoirs that have been affected by these algae blooms? The first step is to try to find some clearer areas of the lake. 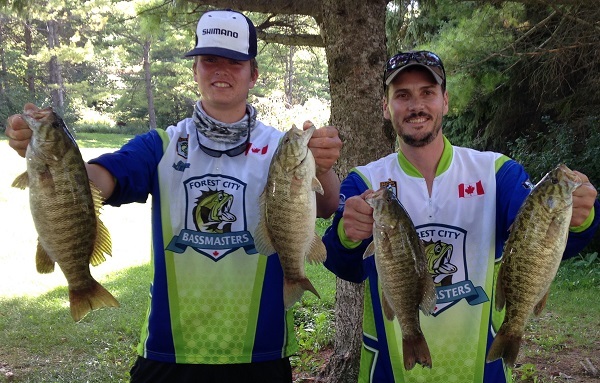 In a recent tournament one arm (fed by a different creek/river) of the lake was significantly greener than the other – with no fish coming out of that much greener area during our time there. There was a big difference in visibility with about 2 feet in the one arm and less than a foot in the other. In another tournament, as we worked our way into a bay/creek mouth the water gradually decreased in visibility (with more algae present), with it went the bites. As we turned around and worked our way out and into slightly clearer water the bite resumed. 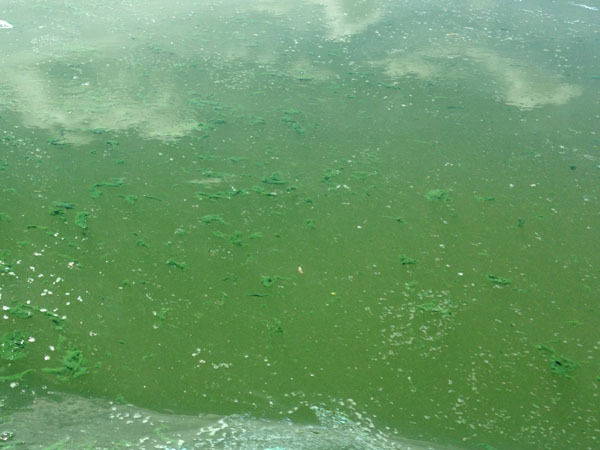 This was not a dramatic change, but there was likely a few inches more visibility and less agglomerations of algae floating at the surface near the main lake as compared to the inner bay. A gradual change in oxygen concentrations may have also played a role here. As the visibility worsens bass (and other fish) will position themselves tighter and tighter to cover. Slowing down and picking out isolated pieces of cover is important. However, seeing this cover can be as difficult for us as it is for the fish so sometimes it pays to just slowly work along the shoreline, particularly if you’re confident, from previous experience or from the look of the shoreline that is visible, that this is a likely area for fish to be present. The fish may also position themselves vertically as the visibility changes as well. At about three times the Secchi depth light penetration is significantly diminished – i.e. its getting dark down there. So when visibility is only inches, fish will come shallower as well (provided temperature and oxygen levels are reasonable). In the tournament with only inches of visibility catches came from generally 1 to 3 feet of water. In another tournament where visibility was better (2 feet) most bites (bass and pike) came from 3 to 8 feet of water. When we plied deeper levels of water only catfish and crappies were caught. Catfish are using smell as their primary sense at this depth. Crappies have some the largest eyes per inch of body length in the freshwater world and so perhaps feel more comfortable in this darker depth. One would suspect walleye would be found deeper in this case as well. 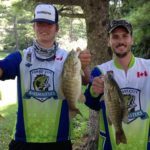 For lures, contrasting and bright colours are good – black and blue for soft plastics and jigs, red and fluorescent colours for crankbaits, black or white for spinnerbaits and chatterbaits. Rattles, crankbaits with a “good thump” to them, and baits that move a good amount of water tend to work best, particularly when searching larger areas of shoreline. We’re looking to have something that allows the fish to use their sense of sound and their lateral line to find the bait. Sometimes though we need to be aware that in higher pressure lakes the fish will learn to avoid these noises and a change to a subtler approach will be needed. A recent event was a good case in point, even though visibility was mere inches, crankbaits and other noisy baits were ineffective, and the top four or five teams reported catches on mainly tubes jigs and larger Texas rigged soft plastics, both having good water displacement attributes. The addition of scents to these rigs may also be useful here. Slow presentations like drop-shotting, when combined with precision casts and added scents can also work well and can allow one to work a small area effectively. Darker or vibrant colours can help here as well with some recent success including purple and green with dark flakes worms, black leech imitations and black/white minnow imitations. Fish Science, Lake Science, Largemouth Bass, Northern Pike, Smallmouth Bass, Tournament, Visibility, Water Clarity.